Just like the week before, Marvel Infinity War-related items took the top three slots, with the Infinity Gauntlet trade paperback, the Infinity War trade paperback, and the Infinity trade paperback topping the charts. The Action Comics: 80 Years of Superman book was the top hardcover. A bit more Marvel in the advance reorder chart this week, with the publisher taking 15 slots. 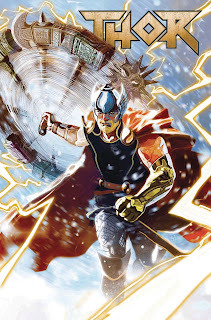 Another Marvel Fresh Start launch led the chart: Jason Aaron's Thor #1, which releases June 13. An Amazing Spider-Man #800 second printing came in second. 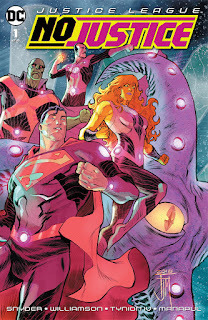 DC's top comic was Man of Steel #3 and Image's top release was Mark Millar's Magic Order #1, both of which are also out on June 13. No May-shipping comics on the advance reorder list: It's too late in the month. And as often happens, no graphic novels made the chart at all, hardcover or softcover. We've seen enough reorders and advance from the past few weeks from Diamond Comic Distributors to be able to collate some information onto pages for May 2018 and June 2018. Check them out for a further glance at the future. Free Comic Book Day is Saturday!